The philosopher with his two eyes sees double, so is unable to see the unity of the Truth. Shabistari was born in the town of Shabestar near Tabriz in 1288, where he received his education. He became deeply versed in the symbolic terminology of Ibn Arabi. 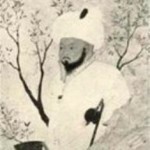 He wrote during a period of Mongol invasions. His most famous work is a mystic text called The Secret Rose Garden written about 1311 in rhyming couplets.